If you're a commercial business in the greater Boston area who is looking for experienced commercial painting experts, you've found the best at Artisan Painting & Decorating, Inc. There's no better way to brighten and liven your commercial properties than to freshen your interior and exterior surfaces with great looking paint colors, textures, and finishes. Commercial painting takes years of developed skill and a focus on every detail to get the results needed. With our quality services providing perfect results and quality paints for your commercial painting projects, you'll have all you need when you choose the professional painting contractors at Artisan Painting & Decorating, Inc. When painting for commercial properties, it's important that the paints, coatings, decorative finishes, and textures are durable and long lasting. It's equally important that they are applied correctly to give our commercial customers the quality they're looking for in decorative finishes. We know that your building represents your business and that your customers or renters will expect your properties to look nothing less than perfect. At Artisan Painting & Decorating, Inc., our years of industry experience is evident in all our workmanship whether we're working on your decorative faux finishes, special coatings, painted surfaces, or refinishing your woodwork. That's why you'll want our professional painting contractors to handle your interior and exterior painting for your commercial properties. 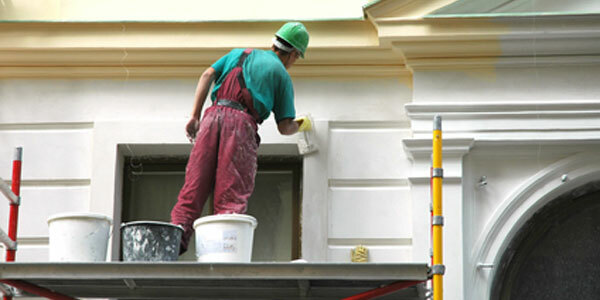 Our Boston commercial painters are trained to complete your job in a timely, non-invasive manner. As experienced commercial painters, we understand the different requirements and safety needs for our commercial customers. When painting things can get in a mess pretty quickly, so our painting contractors make a point to keep your commercial business cleaned up as we go and after we leave. We know that time equals money and delayed projects only make matters worse for everyone. That's why nobody will work harder to complete your projects on time and on budget than we will. As a local professional painting company, we can provide you with painting contractors who excel in their field for all your commercial painting projects no matter how large or small. We commonly work with many different types of commercial property owners including general contractors, architects, designers, and property management companies as well as leading businesses in the Boston area. If your business needs to remain open, we have evening, weekend, and holiday painting crews available to accommodate your specific needs. We employ skilled and dedicated painters, and equip them with the latest technology. As a commercial painting service we have the painting solutions for any size commercial project - from a single unit up to a large commercial complex. We have painting contractors available to handle large or small projects. If you are looking for a commercial painting contractor in the Greater Boston area, then please call (617) 947-0524 or (617) 548-3649 or complete our online request form.